Last 2 weeks we have received many interesting comments on the blogs. Thank you everyone! It is time to announce the winners today. We congratulate Murat for his excellent post, containing source code to add your own 3rd party components to TMS WEB Core. Great post by Murat showing how easy it is to add any existing web component to TMS WEB Core. We will soon inform how we will stimulate such initiatives even more. Thanks Manuel for valuable insights on how we could provide even better integration with frameworks like Cordova or Electron in the future. We want to thank Vieira Edson also for various post comments exploring how TMS WEB Core is a dream for Delphi developers coming true. This blog post has received 5 comments. Where would I find Murat Ak''s post? Really I feel like that, i find delphi again with TMS Web Core. It is so easy doing web coding with pascal code. All power (Object Oriented Pascal and JScript) in your hand. If you like delphi, you like TMS Web Core too. I totaly agree with you Murat Ak, I have been strugle to learn how to desmistify the Angular to enable access part of my ERP througout the Web, but to developer single CRUD modules need a huge amount of effort, and now, after made some test using TMS Web core i believe that make this task no more be so stressful. 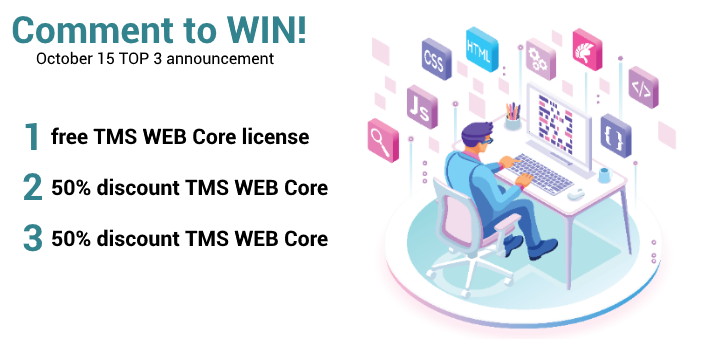 I have been regularly following the news of the development of TMS Web Core since its announcement and I am looking forward to develop a good application with this framework.